The Nissan Leaf is a five-door hatchback electric car. It was the first mass-market electric car to be sold in the United States and is now offered in standard Leaf and long-range Leaf Plus versions. The Leaf received a major redesign for 2018, including new and more conventional styling inside and out, a more powerful motor, and a higher-capacity 40-kilowatt-hour battery pack that enabled an official EPA-rated range of 151 miles in 2018 and 150 miles in 2019. The 2019 Nissan Leaf Plus gets a much larger 62-kwh battery pack, for a range of up to 226 miles. Competitors for the Leaf now include two different groups. The BMW i3, Ford Focus Electric, Hyundai Ioniq Electric, and Volkswagen e-Golf are among the alternatives to the Leaf. While the Chevrolet Bolt EV, Hyundai Kona Electric, and Kia Niro EV are among the alternatives to the Leaf Plus, as they're all rated more than 200 miles of range. The current 2019 Leaf now looks like a Nissan and a normal car, losing the rounded, bug-eyed shape that defined the first generation. While it shares some of the same underpinnings, drivers and passengers will likely never know. 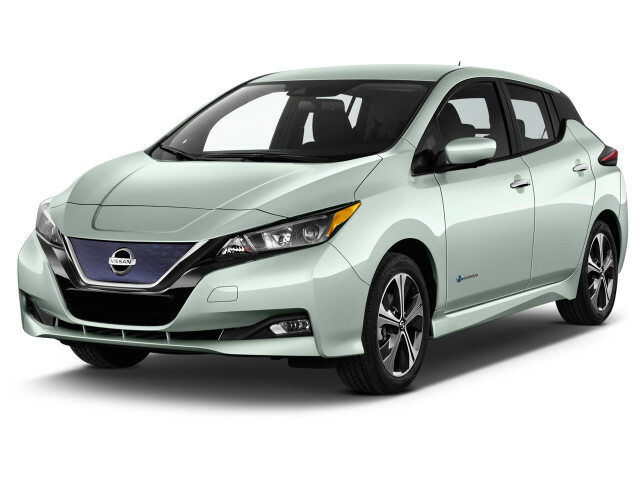 With a new interior, new sheet metal, and a suite of standard or optional active-safety features, the second-generation Leaf is about as comprehensive an update as you can imagine. Versus the pre-2018 Leaf, which some might call the first-generation model, the 2018 Leaf brought a rise in battery capacity, from 30 to 40 kwh, with range rising commensurately from 107 to 150 miles. The motor output is rated at 110 kilowatts (147 horsepower) and 236 pound-feet of torque, versus 80 kw (107 hp) and 187 lb-ft for the 2017 Leaf. The Leaf's onboard charger remains at 6.6 kw, with CHAdeMO DC fast charging available. Nissan says a full recharge takes 8 hours using a 240-volt Level 2 charging station, or 16 hours from a conventional 120-volt household current. Fast-charging to 80 percent takes about 40 minutes—although the Leaf Plus opens up 100-kw (still CHAdeMO) fast charging that can bring the much larger battery in that version to 80 percent in 45 minutes. The latest Leaf models start just over $31,000 including delivery, running past $43,000 for a fully equipped Leaf Plus SL. Depending on where you live (and purchase), multiple incentives might apply, including the full $7,500 federal EV tax credit and state purchase rebates, such as $2,500 in California, where the benefits also include the ability to travel with just a single occupant in the carpool lane. There have been essentially three versions of the Nissan Leaf since its launch as a 2011 model. The 2011 and 2012 models were built in Japan, with prices suffering from the expensive Japanese yen as a result. When Nissan moved Leaf production for North America to Tennessee, it made several important updates and cut the price considerably. 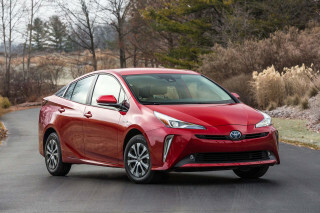 For 2013, the company added a new base-level Leaf S model and made dozens of smaller changes to features and equipment in response to feedback from vocal and enthusiastic early owners. The budget-conscious Leaf S skipped several items standard on 2011 and 2012 models, including LED headlights, alloy wheels, and navigation. Above that, there is the mid-grade Leaf SV and then the range-topping Leaf SL. Significant changes to the Leaf for 2013 included downsizing and relocating the battery charger from the load bay into the engine compartment, which expanded cargo capacity. Equally important to everyday usage was an optional 6.6-kw charger (later made standard on all but the base Leaf S) that cut charging time for a fully depleted battery from seven hours to about four, using a 240-volt Level 2 charging station. (That power is the same kind used for electric stoves and clothes driers.) All Leafs come with a 120-volt charging cord for use with standard household current, but most do not rely solely on it because it takes up to 20 hours to charge a fully depleted pack. For 2015, battery packs remained at the same capacity and range rating, but the cells inside switched to a new and more heat-resistant chemistry that Nissan said would resist very high ambient temperatures better. Some 2011 through 2014 Leafs in extremely hot locales like Phoenix, Arizona, had lost battery capacity far faster than predicted. The new battery chemistry thus far seems to be more durable, but not a lot of data has accumulated thus far. Then, in 2016, the SV and SL models gained a larger 30-kwh lithium-ion battery pack in the same location under the cabin floor, which gave it them a boost from 84 to 107 miles of range. Late in the 2016 model year, Nissan extended the higher capacity to S models and dropped the old 24-kwh pack. For 2017, every Leaf boasted the bigger battery. All first-generation Leafs are powered by an 80-kw (107-horsepower) electric motor that drives the front wheels. The compact Leaf offers enough interior room to deem it a mid-size car, and its weight of well over 3,000 pounds is clearly more in line with the larger category. Like all electric cars, which can develop peak torque from 0 rpm, it is brisk off the line. Acceleration from 0 to 60 mph is in the 10-second range, and top speed is limited to roughly 90 mph. Electric range for the 24-kwh Leaf was rated by the EPA at 84 miles, but that number is not directly comparable to range ratings from previous years, as the states of battery charge—whether to 80 percent (for longer battery life) or 100 percent (for maximum range)—were not consistent among the years. Gentle driving can produce real-world range up to 15 percent higher. Owners quickly learn, however, that range can vary from 65 to 100 miles depending on speed, outside temperature, and how much use is made of the Leaf's heater in cold weather. Most Leafs can also "quick-charge" up to 80 percent of their battery capacity within 30 minutes at special "DC quick charging" charging stations that work on the Japanese CHAdeMO standard. Those stations are still rare, but are being rolled out in regions—Oregon and Washington, parts of Texas—that are working aggressively to adopt electric cars. All Leaf models except the base S include the ability to pre-heat or pre-cool the car while it’s still plugged in, to reduce battery energy use. They can be controlled for this purpose through a website or smartphone app. The Leaf's pale grey, coarse, velvety upholstery material is made from recycled plastic bottles and home appliances; a black interior and leather seats are options as well. The Leaf remains more expensive to buy than a comparably sized gas-powered hatch. Its financial advantage lies in operation costs, which are significantly lower than burning fuel. Even with fluctuation of electricity prices from region to region, the Leaf wins; the national average price per kilowatt-hour is around 12 cents, meaning it costs on average 3 cents per mile. That's compared to 16 cents per mile in a gas-powered car running at 25 mpg on $4/gallon fuel. Good car with some weaknesses.